To whom is the artist more accountable, his audience or his personal sense of aesthetics? Most of us would agree that there is a beauty in truth, and it is the artist’s role to display that truth as he sees it. Which raises a further question; how far should the artist be expected, or even allowed to go in defense of his truth? Many critics would argue that Oscar Wilde’s downfall was a moral one rather than an artistic one, but as a leader in the English aesthetic movement, Wilde’s entire short life, including his morals (or lack thereof) were his personal magnum opus. Whether the work was a “success” is difficult to judge. Oscar Fingal O’Flahertie Wills Wilde, born in Dublin, 1854, was the second of his father’s three legitimate children. To Sir William Wilde’s credit, he did acknowledge his parentage to his three children born out of wedlock before his marriage to Oscar’s mother and provided for their care and education. Mother Jane Wilde wrote revolutionary poetry and was a lifelong Irish nationalist. She also inculcated a love of poetry in her children. At Trinity College in Dublin, Oscar built a reputation as an outstanding student and developed an interest in Greek literature. He was also an active member of the University Philosophical Society, where he began to develop his aestheticism. He went on to read Classics at Magdalen College, Oxford. Attracted to the ritual, dress and secrecy of the society, he joined the Apollo Masonic Lodge at Oxford and was soon initiated in the Sublime Degree of Master Mason. He considered conversion to Catholicism, even though his father threatened to cut off his funding. In the end, Oscar realized he was too much of an individualist to adopt the faith, but he remained interested in Catholic theology and liturgy. 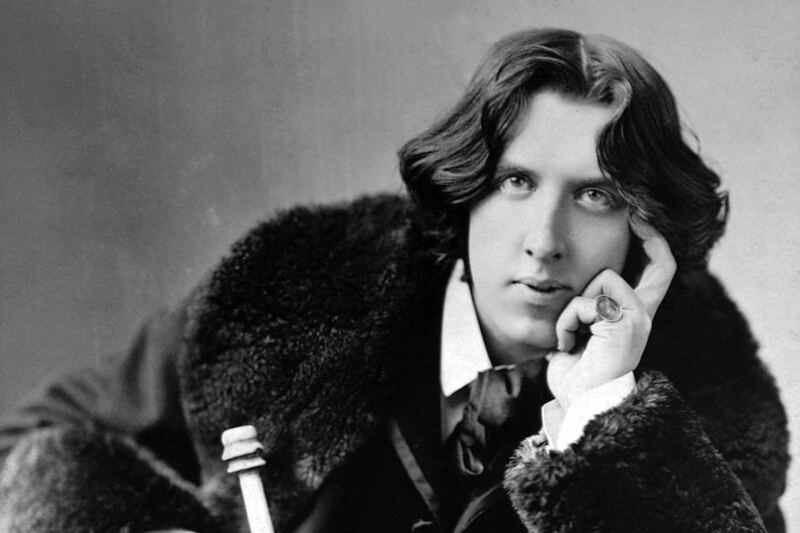 At Oxford, Wilde became deeply associated with the aesthetic and decadent movements. He wore his hair long, dressed in flamboyant styles, and decorated his room with peacock feathers, objets d’art, and blue china. In 1878, he won a prize for his poem “Ravenna”, and graduated with double first class honors. Upon his return to Dublin, he discovered that his childhood sweetheart was engaged to Bram Stoker. Disappointed but stoic, Wilde returned to England and settled in Chelsea. He had been publishing poetry and essays in various magazines since his days at Trinity, so he published a collection of poetry at the age of 27. The book sold moderately well but met with some resistance from critics. 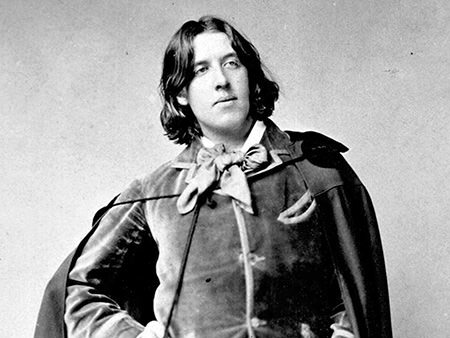 Punch magazine opined “The Poet is Wilde, But his poetry’s tame”. In 1881, Gilbert and Sullivan lampooned the aesthetic movement in the opera Patience. Before the show made its North American tour, Wilde was invited to make a lecture tour to “prime the pump” for the show. The tour was planned for four months but was extended to a full year on the basis of its financial success. Wilde did his best to transpose the beauty he saw in art into everyday life. His flamboyance did not always set well with his critics, but he was welcomed by admirers from every stratum of society as he crossed the country. His earnings from America, along with what he expected to earn from his play, The Duchess of Padua (1883), gave Wilde the means to move to Paris, where he enjoyed a lavish lifestyle. He returned to America in August 1883, for the opening of his play Vera. Recrossing the Atlantic, he was giving a lecture at the Gaiety Theatre in Dublin when he proposed to Constance Lloyd, daughter of a wealthy Queen’s Counsel. They were married in 1884. They lived mostly on Constance’s generous allowance, but their luxurious tastes still managed to strain even that. Oscar fathered two sons with Constance but began to find his wife “repellent” during her second pregnancy. It was about this time that he met an ardent young fan of his work, Robert Ross, a precocious seventeen-year-old who “so young and yet so knowing, was determined to seduce Wilde”. Ross “initiated” Wilde into the world of homosexual love. Ross and Wilde were both well aware that homosexuality were more than simply frowned upon in Victorian England. “Gross indecency between men” and “buggery” were both punishable by imprisonment. Robbie Ross had been persecuted for his proclivities throughout his young life. 15 years older, as an ardent aesthete, Wilde was not about to let societal views get in the way of his idea of beauty. He would pay the price for his beliefs. Soon after his marriage to Constance, Wilde took up serious prose writing. The flair that he had previously put into his lifestyle was a terrific fit for the journalism of the age, not to mention the fact that he had a family to support. He became the editor of The Lady’s World magazine, which would be renamed The Woman’s World under his watch. He filled the pages with serious articles on parenting, culture and even politics. Eventually, he found the daily work of journalism stifling, but it gave him a basis so that his later fiction would be taken seriously. He put together several volumes of short stories, including The Happy Prince and Other Tales, and wrote his only novel, The Portrait of Dorian Gray. He continued to write in support of the aesthetic movement and began to have more of his plays produced. His salary at The Woman’s World was about six pounds weekly while his plays were bringing in nearly one hundred. He took Lord Alfred Douglas, 16 years his junior, as a lover, and the couple were famously indiscreet. Douglas led Wilde into the underground world of gay prostitution in Victorian London. 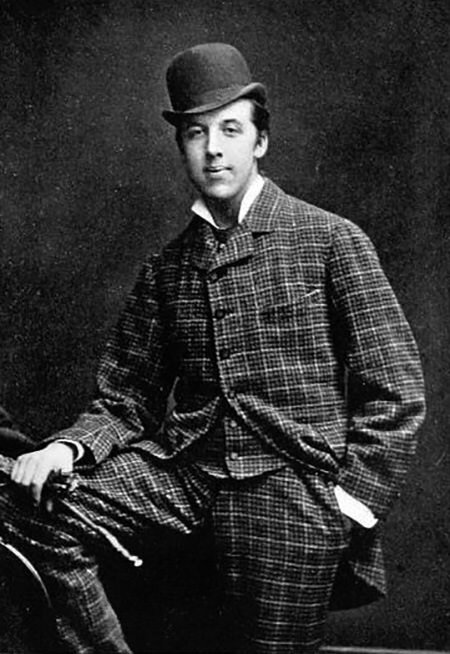 Wilde’s play, The Importance of Being Earnest, was first performed in 1895, and became a smash hit. The show managed to mock Victorian society while celebrating it as the same time. Victorian audiences loved it (as have audiences ever since), and the play is considered Wilde’s masterpiece and a demonstration of his artistic maturity. The same year, John Douglass, the 9th Marquess of Queensbury and Alfred’s father, left a card at Wilde’s club accusing him of “posing sodomite”. Alfred encouraged Wilde to have Queensberry prosecuted for libel, and action which Wilde’s other friend strongly advised against. In a society where reputations were as important as they were in Victorian England, libel is a serious crime. Queensberry would be forced to defend himself by proving that his accusations had merit, which, given Wilde and Douglas’s lack of discretion, was incredibly easy to do. Wilde had Queensberry arrested, and the Marquess responded by hiring private detectives to find evidence that Wilde had homosexual liaisons. The evidence was not hard to discover. Queensberry was found innocent and as soon as Wilde left the court, a warrant was issued for his arrest. In addition to his own actions, he was liable for Queensberry’s legal expenses, so he was facing bankruptcy as well as prison. Although he enters a plea of not guilty, the evidence was hard against him, and what testimony he provided in his defense did more to harm his case than help. 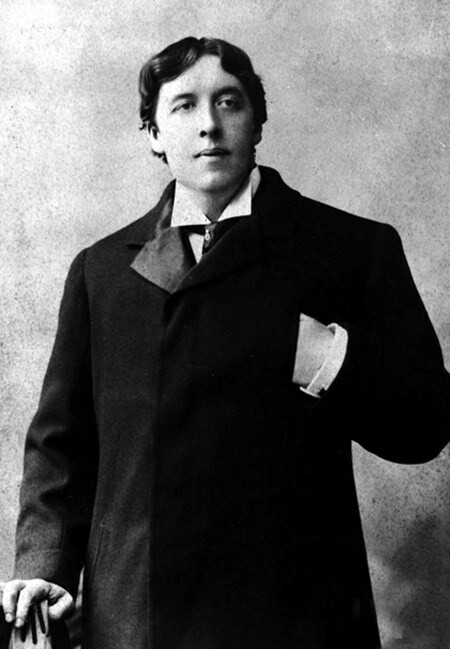 Wilde was sentenced to two years of “hard labour, hard fare and a hard bed”. As an aesthete, he was more than out of his element in prison. Used to many creature comforts, Wilde’s health quickly declined. When he was finally given pen and paper, he set about writing a 50,000-word letter to Douglas, which was eventually published as De Profundis. When he was finally released on May 19, 1897, he sought a retreat with the Society of Jesus, but he was denied. With nowhere else to turn, he left England for a three-year exile on the Continent. Be the first to comment on "Oscar Wilde"